A deck can look absolutely beautiful when it’s originally constructed. But gradually, the deck fades and turns gray. Even if the deck still serves its original purpose, you may miss its original beauty. Fortunately, there are ways to restore a deck to its original beauty. It isn’t difficult to learn how to refinish a deck. Before you begin a deck refinishing, you will need to make all necessary repairs. Look for portions of the deck that are in contact with the ground and repair these sections. These include posts, joists and stair stringers. Try to push a screwdriver through the portion of the deck that is in contact with the ground. If you are able to penetrate the screwdriver into the deck, this indicates that you will need to perform a major renovation. It’s also essential to inspect the connection between your home and the deck. Check the screws and bolts to make sure that they have not become rusted or loose. You may need to replace some of the screws and bolts or at least tighten them. If too many become loose, there is a risk that your deck may sustain even worse damage. There may be old finish residue that you must scrape off. The stain will either be a solid color or will be semi-transparent. When scraping off the stain, use a regular paint scraper and don’t worry too much about making mistakes because most mistakes can be undone with the use of a deck stripper. Before cleaning the deck, it may make sense to cover nearby plants with plastic. While the chemicals used to wash the deck usually will not kill the plants, it will subject them to unnecessary stress. Also, make sure to not apply cleaners or other products on very hot and dry days because the chemicals will evaporate too quickly and you’ll basically be wasting time and money. 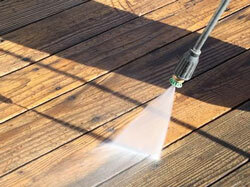 The deck stripper is used to remove loose and chipping stain and deck sealers before cleaning the deck. The deck strippers also allow for the old color to be removed from the deck and for a new color to be applied. Since the deck stain remover needs to remain moist to be effective, you will need to apply it to only a six-foot section at a time so you will have time to scrub and scrape it. Again, it’s really important to avoid this part on hot days, especially in direct sunlight. It can be difficult to work with a deck stripper on vertical surfaces, so it is a good idea to smear the fluid upward as it runs down while scrubbing and scraping it. To wash the deck, first use a broom and/or a leaf blower to remove debris from the deck. Then, the deck must be cleaned with a commercial deck cleaner that removes mold and mildew. To find the best mildew remover, make sure that it comes with sodium bicarbonate. Each product will have its own unique instructions for mixing it. Also, make sure to wear rubber gloves when applying the mixture. After the solution has been applied to the deck, use a thick-bristled brush or a broom to scrub the solution into the deck. Oftentimes, this is enough to return the deck to its original shine. Another approach, if you have a much larger deck, is to use a pressure washer. The pressure washer should be adjusted to about 600 to 800 PSI. Try to spray in line with the wood grain. The nozzle should create a spray that has an arc about 25 to 40 degrees. Wide gaps might form in your decking and it may be necessary to fill these gaps in with paintable caulk. Choose a version that is able to adhere to wood and that is able to handle foot traffic. Before applying the coating, find out how long it takes to cure as some coatings can take several days before they are ready to be stained or painted. 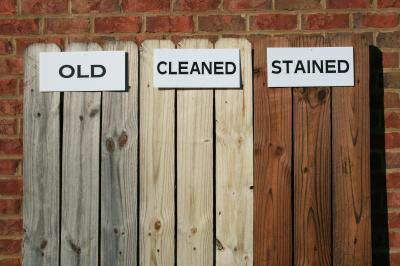 Once the old stain is removed and the deck has a thorough cleaning, it’ll will be ready for restaining. When applying the stain, make sure to work with the grain. Use a 4-inch brush to apply the stain evenly and a narrower brush for smaller or harder to reach areas. 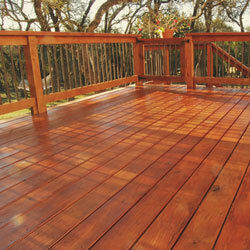 An even faster way to apply stain to a large deck is with the use of a roller. Afterwards, use a brush to work the stain into the deck. Wait one to two days for the stain to dry. Obviously, you’ll want to check the weather forecast beforehand. If you’d rather paint the deck, sand any rough patches (a random orbit sander works great) so the deck is smooth. Given the size of decks, the most-efficient way to apply paint is to use a paint roller. Roll the paint over the deck and use a brush to apply paint to hard-to-reach areas. Allow the paint to dry before applying additional coats. After the paint has dried and the other steps have been followed, you’ll have a deck that looks brand new and you’ll save a whole lot of money by doing it yourself.